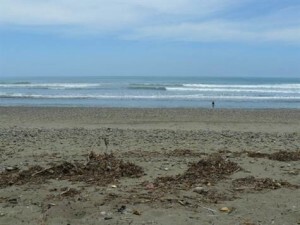 In the booming beach town of Dominical there is no better beach front hotel site than this. 2.5 acres of perfectly flat, usable land in the heart of town and directly in front of the beach. The property already has it’s concession and permits and is ready to be built on. With this amount of land you could build a hotel, cabinas, restaurant, casino, or anything else that you ‘re imagination can come up with. Dominical already has an extensive tourist industry and when the road is paved south from Quepos in the following years it is sure to grow exponentially. This is a rare opportunity to have beachfront property in our community that should not be passed up.